THE HEROESONLINE BLOG | HEROESCON 2019 :: 3 DAY ADVANCE TICKET SALE – $37.00 NOW THROUGH CYBER MONDAY! 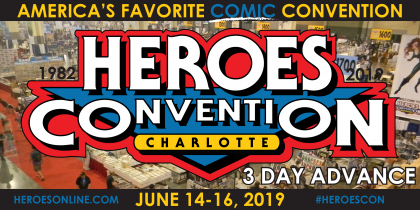 HEROESCON 2019 :: 3 DAY ADVANCE TICKET SALE – $37.00 NOW THROUGH CYBER MONDAY! NOW THROUGH MIDNIGHT CYBER MONDAY, NOVEMBER 26, 2018! In celebration of our 37th Annual Show, Heroes is doing a SALE from NOW until Midnight on CYBER MONDAY, November 26, 2018! Get your 3 Day Advance Pass for HeroesCon 2019 for just $37.00!! THIS YEAR, we are shaking up our admission policy by doing something that NO OTHER 3-Day Comic Convention has done before…HEROESCON 2019 will allow ANY ATTENDEE *18 years of age and Under* IN FOR FREE! HeroesCon Guest List Announcements and Hotel Rates to be announced SOON!! So, just in time for the Holidays, GET YOUR HEROESCON 2019 PASS EARLY and SAVE!!! We look forward to seeing ALL of you June 14-16, 2019!! ← TOYS FOR TOTS 2018 TOY DRIVE! !